Promoting the different types of cardiac screening assessments available to young people and advertising the upcoming screening events available within the South West. 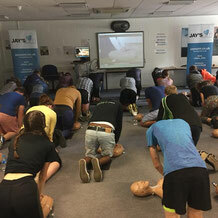 Informing young people about cardiac risk and how sudden cardiac death in the young can be prevented, through interactive face-to-face visits to schools, sports clubs and businesses. 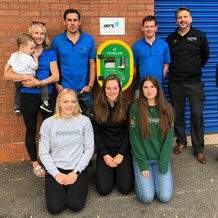 Working with the South West's schools, sports clubs, and businesses to make a difference, by providing both basic and advanced CPR/Defibrillator training and automated external defibrillators (AEDs) to the venues most in need. Watch our new 2019 short film that explains why Jay's AIM was set up, what we do, and what we have achieved so far. The map above shows all of the public access defibrillator (PAD) locations that Jay's AIM have provided. Click on the icon at the top left corner of the map to see the locations listed and use the positive/negative symbols to zoom in or out (some places have multiple PADs).